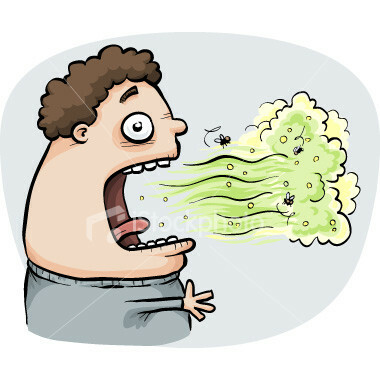 Bad breath is said to be caused by both liquids and solid foods, the liquids being more involved in certain reactions and production of compounds, and solids being adherent to tissues and tongue surface, leading to the poor oral health and bad breath. Garlic and onion pastes – Although this is not eaten directly, the paste of garlic and onion in foods that adds tastes, but also is responsible for the production of volatile sulfide compounds. These compounds have a rotten-egg odor. Alcohol – The smell produced from the fermented juices like alcohols give a very unpleasant feel, and these alcoholic compounds are usually alkaloid and reactive, which not only are foul odor producing, but also has many health hazards like damage of liver etc. Sweet drinks – Drinks that contain sugar or carbohydrates are one of the major reasons for occurrence of bad breath in many people. These sugary foods are attacked by the bacteria, which produce strong acids, leading to tooth decay. This later leads to accumulation of food debris and bad odor from that. That’s the reason it’s advised that consumption of these sweet beverages or fruit juices are to be followed by oral rinsing or tooth brushing. Carbonated drinks – The cold soft drinks that contain gases like carbon dioxide to make it acidic and strong, actually are strong enough to damage the surface layers of teeth and one of the basic reasons for tooth decay, later the release of foul smell in the oral cavity. Coffee – The most common beverage that has alkaloid nature, and some compounds remain on the oral tissues, producing the volatile compounds, that cause bad breath. There has always been a controversial debate on whether it’s solid or fluid components, which lead to bad breath. Solid foods usually adhere on the tongue surfaces, or accumulate in decayed areas of the teeth and get reacted slowly by the bacterial flora, to produce bad breath. But fluids, which people believe to have no effect, are also risky factors due to their acidic nature, presence of carbohydrates and other reactive components. Solid foods can be washed away usually with the help of saliva that continuously flows in the oral cavity, but the same can’t occur with fluids as they have the same flow and their rate of reaction with microorganisms is greater than that of solid foods.